Heat oil. Add chilli mix, vegetables & stir-fry. Add water, cover & simmer for about 1 min. Tip: Insert toothpick into fish. Fish is cooked if toothpick pierces through easily. 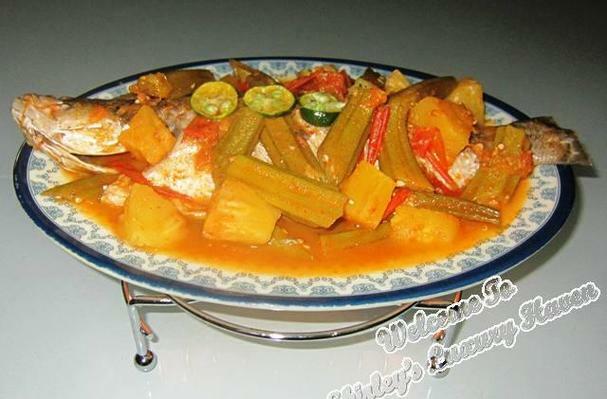 Dish out your fish & place the serving plate on a warmer to retain its temperature. Drizzle the sauce over a plate of fragrant rice & enjoy. You'll never get enough of this Thai-style Seabass! The 1st time I tried this spicy, sweet & sour fish was at a Zhi-char (煮炒) stall near my home. Zhi-char stall is a modest stall that’s found in coffeeshops where Chinese home-style dishes are cooked to your order. Now, I’m gonna show you how you can cook this too, in under S$10 & you don’t need to be a pro to do this.